Beatrice Wood, ...how lucky men are!, 1932, pencil and watercolor on paper, 6 x 9". Beatrice Wood is best known for her lusterware pottery, so this exhibition of nearly fifty works on paper, made over the course of a staggering eighty-seven years, is surprising and also gratifying. Despite drawing on styles that veer from commercial illustration to delicate abstraction and Cubist figuration, Wood’s distinct visual stamp and sensibility persist through changing influences and decades. The drawings have the combined openness and intimacy of a daily diary, revealing the wit and humor, pathos and joie de vivre for which Wood’s so well known. 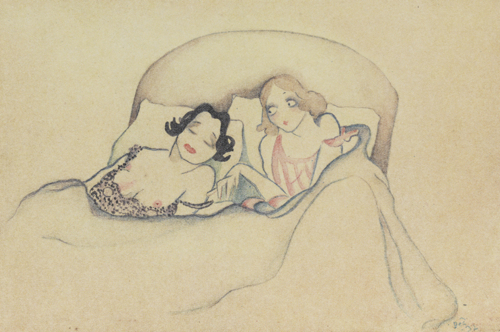 For example, works from “Touching Certain Things,” 1932–33, depict sexually tinged interactions between women with a directness and sweetness that remains, despite a quaint illustrative style, radical for our times. Though less overtly sexual than the other works in that series, . . . how lucky men are!, 1932, suggests closeness and comfort between the two women depicted, here propped in bed on fluffy pillows and clad in filmy negligee, leaning in towards each other. A number of drawings explore dream and emotional states through abstract figuration. The outlined figures in Meeting of four women who hated each other, 1983, sway to and fro as if in a dance, surrounded and connected by a rush of red lines. Organic shapes in shades of pink make up the fleshy bodies that encircle the woman in black at the center of Nun’s Dream, 1996. Amid the drama and caricature, narrative and humor, several figurations of a more minimal bent provide quiet moments, including Untitled (intertwined legs), 1977, in which a thigh, pointed toe, and rounded rear hover gracefully in the center of a page torn from a sketch pad.